KEN SISTERS WIN THE WYNNE! at News Aboriginal Art Directory. View information about KEN SISTERS WIN THE WYNNE! It's that time of year again when the Art Gallery of NSW gets down and populist with its Archibald, Wynne and Sulman Prizes announced today. The Archibald is the 'Big Telstra' equivalent, of course. But the greatest Indigenous significance this year lies in the Wynne, where landscape is the priority and three and a half works fall into the Indigenous category. And the glorious double canvas from Tjala Arts in Amata in the distant APY Lands is the winner, just as I predicted a week ago! The five Ken Sisters – Tjungkara Ken, Yaritji Young, Freda Brady, Maringka Tunkin and Sandra Ken - have tackled their 'Seven Sisters Tjukurrpa' collaboratively, somehow communicating the harmony of a single artist while each contributing something individual to the substantial work. Brilliant desert colours make it the stand-out work in a trio of rooms where non-Indigenous artists reflect the grey/green or dun colouring of the Aussie landscape in most of their works. What joy that desert artists were given acrylics to reflect the landscape of their mind's eyes rather than ochres that actually derive from that Country. And four of the five sisters were confident enough to come to Sydney for the traditional noon announcement of the winners – smiling, laughing and hugging each other in celebration. “When sitting down to have a chat with the women about the work and the story behind it”, explained Natalie O’Connor, Manager of Tjala Arts, “they talk about family. In the Seven Sisters story, the elder sisters protect and teach the younger sisters and keep them from falling for the tricks of Watti Niru. The women say this is how family works in Anangu culture – the elder women teach the young women”. Artist (and former Archibald Prizewinner) and Trustee of the Art Gallery, Ben Quilty commented that the Wynne was really easy to judge this year – as the Trustees do. "The Ken Sisters work just stood out, while the Archie had been a much closer contest". Mind you, Quilty had just come back from a two week trip to the APY Lands, so perhaps he was just tuned in. Also showing in the Wynne are two Papunya Tula entries: a prime George Tjungurrayi canvas (which was Highly Commended by the judges) and a fine Yakultji Napangarti work – both offering op-art reflections on the sand-dunes of the Western Desert around Kintore, where they paint. And, talking of reflections, just round the corner from the Tjungurrayi work is an Imants Tillers multi-canvas artwork that appears to be about Venice (isn't the Wynne for “the best landscape painting of Australian scenery”?) including the odd words by artist George de Chirico, “Oh Venice/Your Sea Contains Dangerous Fits of Anger/May God Decree Your Lagoon/Become an Unrippled Lake”. But then, just maybe, the Aussie landscape does enter the picture via some ripples that seem to have lifted off George Tjungurrayi's work – sand magically mutating into water in the artist's post-Modern hands. 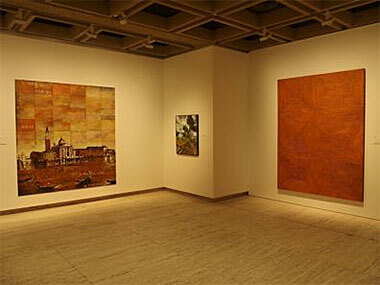 The Tillers is therefore the half Indigenous work referred to above – Highly Commended in the Wynne. Meanwhile, there's only one Aboriginal subject in the Archibald this year – a self-portrait by serial prize-winner, Tony Albert. Not content with taking out both the $100,000 Basil Sellers Art Prize and the $50,000 Telstra National Aboriginal & Torres Strait Islander Art Award in 2014, he's just won the world's richest landscape prize with his work 'The Hand You're Dealt' – a collage of playing cards, many with tasteless Indigenous designs. An odd definition, once again, of 'landscape' – but it must have satisfied the judges of the $65,000 Fleurieu Art Prize for Landscape, showing in Adelaide at the Samstag Museum of Art in until 29 July. But Albert's is an interesting work – actually a spare, single canvas for once after a series of installations and photographs by Albert. 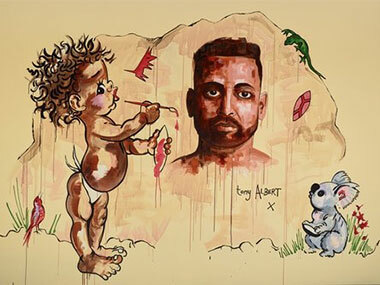 It shows our Tony apparently being painted by the cartoon figure of Tinka – the extraordinarily popular Aboriginal kid created by the late Viola Edith (Brownie) Downing for a series of books she wrote in the 1930s as she travelled around the world. They even made a TV series from them in America. Finally, there's the Sulman Prize, judged this year by Brisbane Blak artist, Judy Watson. No one ever knows what the criteria are, but it's supposed to be for the “best genre or subject painting, representing some aspect or aspects of everyday life”. Reko Rennie's 'Warrior', wearing Rennie's neo-camouflage, his spear raised against a hyper-pink, orange and yellow background, doesn't strike me as “everyday life”, even for a Melbourne-based Blak artist. But it's colourful! And it lost out to Esther Stewart's similarly coloured abstract painting of a building, called 'Flatland Dreaming'. I don't think it was an Aboriginal Dreaming.